(MENAFN - Muscat Daily) Muscat- Former Sri Lankan captain and the chief development officer of Oman Cricket (OC), Duleep Mendis, has lauded efforts to take cricket to Omani schools. OC recently signed a Memorandum of Understanding (MoU) with the Ministry of Higher Education (MoHE) to promote the game among Omani children. 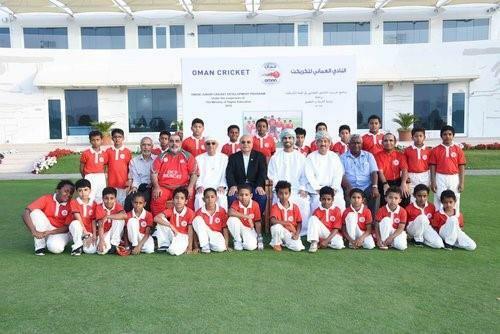 Following the MoU, an 'Omani Junior Cricket Development Programme', was launched at the Oman Cricket Academy in Amerat. A total of 25 Omani students, including as young as ten year olds, are being imparted basic cricketing lessons by OC-appointed coaches Desmond Berhardt and Javed Abdul Qadir al Balushi. 'The whole idea of taking cricket to the grassroots level in Omani schools was mooted by OC's Board of Directors, particularly Pankaj Khimji and Madhu Jesrani who in consultation with the Ministry of Sports Affairs and MoHE, worked hard to bring this to fruition,' said Mendis, while addressing a gathering of players, parents and OC officials. 'This is a wonderful programme for the community. They can really benefit from the training facilities provided by Oman Cricket. It is bringing young children to cricket grounds. Keen to provide maximum support to the budding cricketers and their parents, OC has appointed board member Dad Mohammed al Balushi as the camp manager and Sabah al Fadhil as the camp coordinator. The training camp, which started on February 22, is held twice a week - on Monday and Wednesday. Parents come to drop their children and stay on to watch them bat and bowl. 'My son is very happy to be able to play cricket. Every Monday and Wednesday he waits to come here at 4pm. I am happy to see my son learning something new and exciting. I hope he becomes a good player and represents Oman in the future,' said an elated Khalfan al Mayahi. Muneera Saud al Shukairy cannot take her eyes off her son as he runs, trains and tries to bat straight. 'I am proud of my son that he is trying to learn a new sport. Cricket is so new to us but it is exciting.My son was very excited the first day he brought a form from his school and told me that he wanted to join the cricket training camp. Despite my reluctance he made me sign it. Now I am happy to see him play.